Last week, I had a thought. All right calm down, it happens occasionally. As a professional diver, I spend a lot of time in the waters around Bali and Nusa Lembongan, but I don’t really know where the seasonal cold waters and super-fast currents come from. Yes, I know that sounds a bit odd, but think about it. Most of us are familiar with the idea that the moon causes tides and the wind causes waves but even so, where do all those ripping currents come from? And why does the water get so cold at certain times of year? If you have been lucky enough to dive around Indonesia, or dive Bali in particular, you may be familiar with the very strong currents that we sometimes have here. This not only provides an excellent source of nutrients to the waters around the nusa islands of Lembongan, Ceningan and Penida but it also lets us ride these currents in some spectacular drift dives! It turns out that the currents that pass around these islands every day have their very own name and are recognized globally as “The Indonesian Throughflow”. Admittedly, that sounds like something you may experience after some of the local street food but it’s only a name. “So what”, you say. “It has its own name”. “So does the groove on your top lip below your nose, but it doesn’t mean anything to me in day to day life does it?” (It’s called the philtrum by the way). Well it turns out, it matters more than you would think, wherever you live in the world. 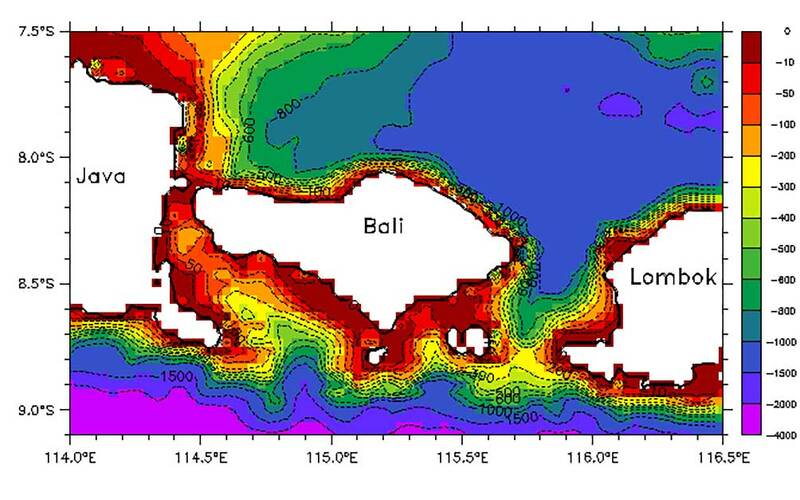 The Indonesian Throughflow (ITF) is a predictable ocean current with a massive importance for the global climate. It essentially provides a pathway for warm, fresh sea water to move from the Pacific into the Indian Ocean. This is in in the upper part of, what is known as, the “Global Heat Conveyor Belt”. Woah! Slow down there cowboy… The Global Heat Conveyor Belt? What is that about? I started with one question and as always, find another to look into before I can answer my first. A rather simplified version of the global conveyor belt. Check out the pic on the left. I know, it’s a pretty sweet looking graphic. Yes, it’s a simplifies explanation for what we now know is a complicated process but stay with me here… you may learn something interesting. The starting point of the Global Heat Conveyor Belt is towards the top left of the picture. This is where the warm ocean currents of the Gulf Stream drive into the North Atlantic and reach the Arctic Circle. Once there, the ocean heat dissipates into the surrounding area and the cold water is driven downwards into what is known as deep water masses. 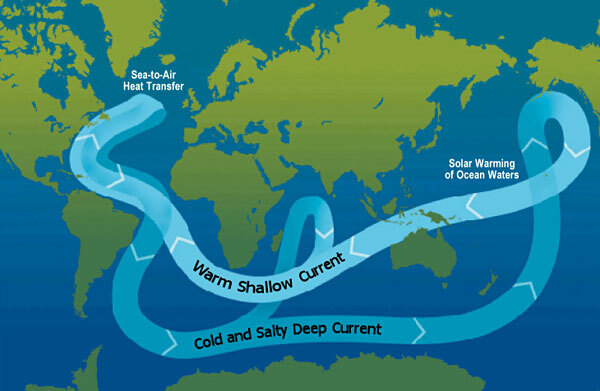 The warm waters of the Gulf Stream are responsible for providing up to 30% of the heat budget given to the area. Without it, the life struggling to survive there would be so cold that even the polar bears would need mittens. An Interesting sciency bit: You’ve probably never thought about it before, I hadn’t. As water flows into the polar regions it becomes colder… Sounds obvious enough. When it gets cold enough, the “water” in the seawater starts to freeze leaving denser, saltier ocean water behind. Because the water is denser, it starts to sink and surface water moves in to replace the sinking cold water. And that my freshly educated diving buddies, is how the Global Heat Conveyor Belt currents are created. Back to our conveyor belt… Our denser, extra deep, extra salty, extra cold ocean water now slowly reverses course and start to make its way South. These deep-water masses continue down the East coast of South America where they are forced further Eastward by underwater topography, eventually upwelling into the Indian and Pacific Ocean. As the waters upwell near the surface, they start to warm and mix with surface water and the topology of the land helps to force another reverse in direction of the currents. The surface warm water then slowly makes its journey South West over the top of Australia and through Indonesia, (now you can see where I’m going with this). It continues past the South coast of Africa and back into the Atlantic where it is pulled in to replace the cooling waters in the North and completes the circuit. And yes, that’s a little longer than I’ve been diving. As you can now appreciate, all that water in the Pacific freshly warmed and on the move, has to get back to the West. There is so much water there, more on that in a minute, that sea level is 150mm above average. Conversely, the Indian Ocean has a sea level 150mm below average. Conveniently for us, one of the most direct routes from the Pacific to the Indian Ocean is directly through the Makassar Strait, continuing on through the Bali Sea. From there the waters either take a slight detour East to the Banda Sea or carry straight on end exit through the Lombok Strait. Hold on a minute. This is another of those pesky facts that I could ignore but give me a minute and we’ll explain a little more.. If you were paying attention, I said that on average, there is a 30cm difference between the Indian and Pacific Oceans… How in the world does that happen? The difference is caused by a combination of underwater topography, the trade winds and ocean currents that run in opposite directions in the northern and southern hemisphere. The end result is that this is the largest movement of water anywhere on the planet. The Lombok Strait, which lines up nicely for the moving currents, is approx 35km wide and up to 400m deep. Not all the water on the move can fit though this channel but it does provide the most direct path from one to the other to help balance the sea level difference… nature does seem to love balance. Virtually everything that dies in the ocean sinks to the bottom, assuming it doesn’t get eaten first. This rotting detritus and super rich layer of nitrogen based nutrients and phosphorous is moved along by the Global Heat Conveyor Belt and eventually gets caught in the upwell ending where? You guessed it, in the Pacific where its journey carries it to the Indonesian Throughflow right past our front door. All that lovely warmed, diveable (is that a word), water bringing eggs and lava of the marine life of the Indo-Pacific with it. Nutrients, minerals and a water throughput like nowhere else on earth passing by. This is the reason why the underwater life is so diverse and abundant in the area. Yeah, yeah, diversity blah blah blah, we drone on about it all the time.. But it’s true! There are over 4000 identified species of marine life here. Compare that to the 1000 or so in the Red Sea and the 400 in the Caribbean and you see why we make such a big deal about it. Fancy some more science? Hold on, I’ll lay it out for you. The volume of water associated with the Indonesian Throughflow is so enormous that numbers seem to get a little unimaginable. 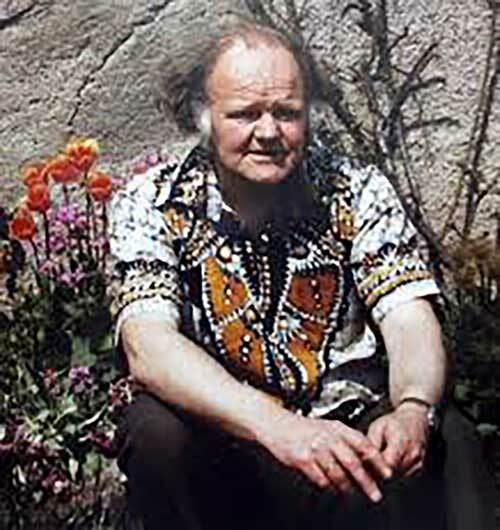 Step up Harald Sverdrup, Norwegian scientist and all round clever chap who came up with a unit of measurement known as the “Sverdrup”. Clever but no sense of imagination… or taste in shirts apparently. A Sverdrup describes “one million cubic meters of water per second”… got that? 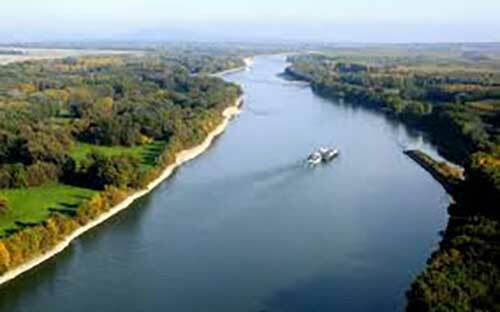 In simple terms: Imagine a river 100 meters wide and 10 meters deep flowing at 4 knots (4.6mph / 7.4kph). Now imagine 500 of those all flowing together… That is the amount of water in 1 Sverdrup. It’s estimated that the total amount of seawater passing through the Indonesian Throughflow is between 20 and 22 Sverdrups which doesn’t sound so impressive, but that’s equivalent to 10,000 of our imaginary rivers. 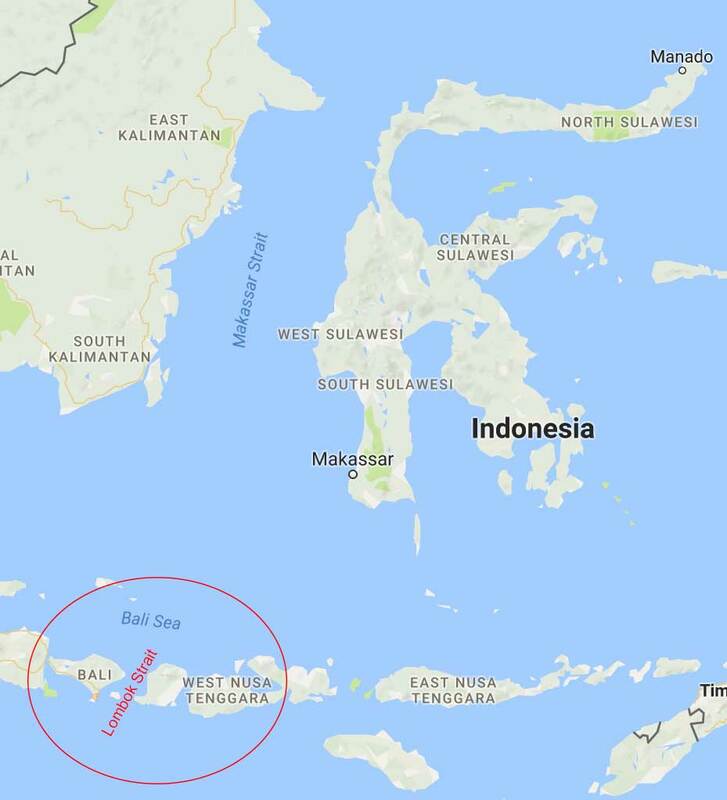 That is the amount of water that has to pass through the chain of islands at the bottom of Indonesia which stretch from Timor in the East to Bali in the West and out into the Indian Ocean. Here’s a picture of Harald himself… and a river, in case you were wondering what one looked like. We’ve already established that there is a lot of water swilling around our little islands but how much and why? It’s estimated that around 20% of the water movement of the whole Indonesian Throughflow passes through the 35km wide Lombok Strait, which is about 1500 of those imaginary rivers we mentioned earlier. If you look at the underwater topography of the area you can see that that with an average depth of 1,500 meters before the water enters the strait, the bottom rises sharply to around 300 Meters in the middle. As the water passes Bali and the nusa islands, all that water is squeezed between Bali’s east coast and the south west of Lombok with the islands of Lembongan, Ceningan and Penida right in the middle. A few kilometers south and the sea bed drops away again to 1,500 meters and then to 3,000 meters in the Lombok basin. Hardly surprising that our little islands have a reputation of some of the most exciting drift dives in the world. This combines with the seasonal upwellings from deep waters around Bali and starts to explain Bali’s incredible reefs and diving locations. It also helps to explain the seasonal variation in water temperature. A toasty warm surface temperature of 29 degrees Celsius can get down to 16 degrees in our seasonal “cold snap” in June to August. This happens as the Throughflow picks up speed and colder Pacific waters are being exchanged in the Throughflow. This time of year is also the best time to see the deeper dwelling ocean creatures like the mola mola as they come up into cooler shallower waters. Thanks to the Global Heat Conveyor Belt and the Indonesian Throughflow we not only have incredible biodiversity in the area but also some of the best dive sites in the world. Follow us on Facebook, Instagram and Twitter to keep up with our news and overall underwater sillyness.